The Indian Table Tennis Team returned from Indonesia after making history. The Men’s team won a Bronze medal, and Manika Batra became the first Indian female athlete ever to win a medal in Table Tennis at the Asian games. 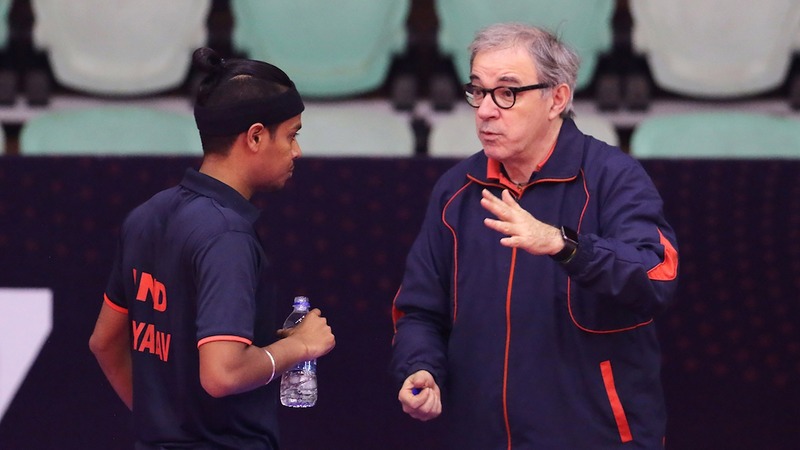 Before the event began, coach Massimo Costantini talked hopefully about the chances of securing a medal in a sport dominated by traditional teams from the continent. We caught up with him in an exclusive with CEAT UTT to get his views on the experience as a whole. The men’s team beat the highly-ranked Japanese team on their way to the semi-finals, a result that left the coach extremely satisfied. “What made it special was to beat someone better than us and cause an upset, like in the (Men’s) team event when we beat Japan. With two points from Sathiyan, Sharath’s one point and Harmeet’s contribution, leading 2-1 at one point, it was a great performance overall,” beamed the coach, speaking on the intense encounter with the world no. 3 ranked team. “The master piece was the mixed-doubles with Manika and Sharath, and that after beating Jeon Jihee and Lee Sangsu (in the round of 16),” said the coach on the other highlight for the Indian team at the event, the mixed-doubles Bronze, courtesy Manika Batra and Sharath Kamal. The Indian Table Tennis team’s performance is in line with India’s best-ever finish at the Asian Games, with 69 medals in all – 15 Gold, 24 Silver and 30 Bronze medals registered. The Indian contingent of paddlers are all set to take on top paddlers from around the world at the ITTF World Table Tennis Championship, starting on the 21 st of April in Budapest, Hungary. Sathiyan books place in ITTF Men’s World Cup! Dabang Smashers’ captain and India’s highest ranked paddler in the ITTF world rankings, Sathiyan Gnanasekaran, booked his spot in the ITTF Men’s World Cup, Chengdu that will commence on the 25th of October 2019.